Back in the winter of 1977 when I made preparations to travel to the United States to attend graduate school, my late mother took me to Karachi's "Landa Bazar" to help me pick out imported extra warm second hand clothing. The purchased item appeared to be brand new, especially after dry-cleaning. I would not have survived my first months in New York without the winter coats and jackets and accessories like caps, gloves and boots bought in Karachi, Pakistan. 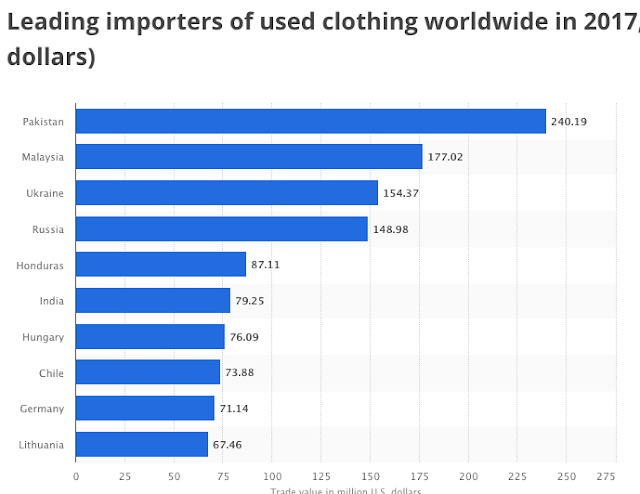 A recent look at the Statista stats portal's 2017 data revealed that Pakistan imported $240 million worth of used clothing making it the world's largest importer in this category. A Pakistani newspaper headline last week screamed "Sale Of Second Hand Warm Clothes Picks Up In Landa Bazars Hyderabad". Landa Bazars is the name of "flea markets" that specialize in selling used clothes and they do brisk business at the start of each winter. These markets are found in all major cities and cater to middle-class and poor customers looking for moderately priced warm clothing for a couple of weeks of cold weather. Pakistan has a huge domestic textile industry that meets the needs of the people with relatively cotton clothing for the rest of the year. Pakistan is also a big exporter of ready made garments. The second hand clothing that I used in my first few months in the United States in the winter of 1977-78 was purchased at Karachi's Landa Bazar. The purchased item appeared to be brand new, especially after dry-cleaning. In the next winter season when a new batch of Indian and Pakistani students came to the campus, I passed these on to those who came unprepared my heavy winter coat and jacket. Used clothing exports added up to $3.67 billion in 2016, according to MIT's Observatory of Economic Complexity (OEC). The top exporters of Used Clothing included the United States ($648M), Germany ($371M), the United Kingdom ($348M), China ($219M) and South Korea ($214M). The top importers in 2016 were Pakistan ($206M), Ukraine ($166M), Kenya ($131M), Malaysia ($129M) and Ghana ($126M). Americans donate used clothes, including slightly used clothes hanging in their closets, to charities such as Goodwill and Salvation Army. These donations pick up during holidays when people clear out their closets to make room for new purchases. American tax law encourages such charitable donation which are tax-deductible. Some of these used clothes are sold by charities at stores like Goodwill stores and Salvation Army thrift stores and the rest are exported. America's secondhand clothing business has been export-oriented since the introduction of mass-produced gar­ments. And by one estimate, used clothing is now the United States’ number one export by volume, according to Slate.com. 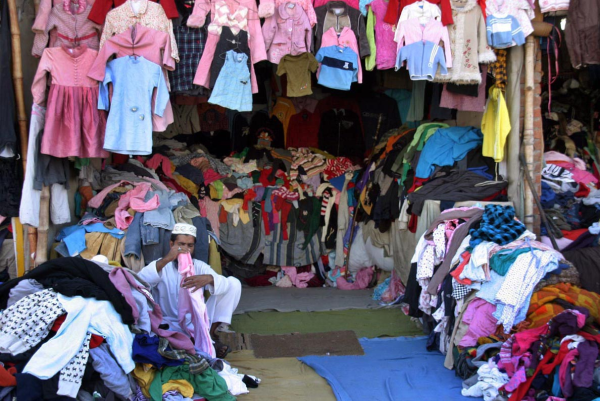 Global trade of secondhand clothing is near $4 billion a year. United States is the biggest exporter and Pakistan is the biggest importer of used clothing. The second hand clothing that I used in my first few months in the United States in the winter of 1977-78 was purchased at Karachi's Landa Bazar. The purchased item appeared to be brand new, especially after dry-cleaning. In the next winter season when a new batch of Indian and Pakistani students came to the campus, I passed these on to those who came unprepared my heavy winter coat and jacket. Landa Bazars is the name of "flea markets" that specialize in selling used clothes and they do brisk business at the start of each winter. These markets are found in all major cities and cater to middle-class and poor customers looking for moderately priced warm clothing for a couple of weeks of cold weather. Pakistan has a huge domestic textile industry that meets the needs of the people with relatively cotton clothing for the rest of the year.